While living in Canaan, Joseph did not know what God had in store for his life. Every event, every place he lived and every circumstance provided a training ground of preparation for the task of saving the lives of many people, including the lives of his own family through the great famine. God had planned Joseph’s life and laid out the details long before he was ever born. He unknowingly would be responsible for bringing the entire family of Jacob into a foreign land as prophesied by God to Abraham. They would become a nation in Egypt and become the lineage through which Jesus Christ the Messiah would be born. But before this could happen, Joseph must make the choice to follow God’s leading and be obedient to the call God had for his life. He had a choice to learn and grow in the circumstances or to pout and feel sorry for himself. Joseph chose the higher calling and as a result he used every situation in his life to learn the things he did not know. Even though he knew not the future by his obedience and contentment in trusting God, Joseph was learning many things in preparation for a task he would be called upon to perform. Remembering that Joseph was a Hebrew boy and spoke only his native tongue, his first task would be to learn the language of the people he now lived among. He would quickly learn to speak, read and write Egyptian. This enabled Joseph the ability to rise quickly in Potiphar’s house and be placed in charge of his entire estate. His responsibilities included keeping ledgers of business transaction for Potiphar, recording the dealings with other slaves, bartering and recording the accounts for livestock and food sources, as well as overseeing their agricultural and financial needs. He became the administrator of Potiphar’s estate and had authority over all. Joseph would also learn the culture of the Egyptians both rich and poor. He would learn the skills of entertaining high-ranking officials and families, talking to and serving others, listening to those in authority, learning their thoughts, emotions and passions including their belief in Egyptians gods. Joseph would be exposed to the knowledge of the Egyptians yet keeping the faith of the one true God. 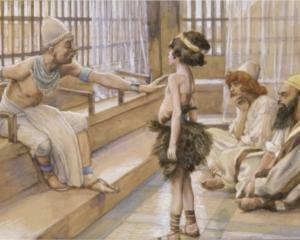 In prison, God continued to bless Joseph and teach him the ways of the Egyptians. Joseph would learn the protocol of Pharaoh’s court, the laws of the land and knowledge of the men who were imprisoned there. He would make contacts with the cupbearer and others that would be beneficial to him later. He would meet those from foreign lands and learn of their cultures. He would learn the task of feeding the prisoners, ordering and stocking food supplies and keeping records of prison activities. He learned the inner working of the prison and the court. It wasn’t long before Joseph was placed in a position of authority over all the prison, all in preparation of a task yet to come. God is in the circumstances. He uses all things that happen to grow your faith and bring glory to Himself. God is now using every circumstance in your life to mature your faith and to prepare you for a task/purpose He has planned for you. He prepares you for accomplishing His plan and by giving you ways to prepare for this task. Joseph wasn’t given the responsibility of Vizier of Egypt and the task of forgiving his brothers for what they had done to him until God’s timing was right and Joseph had grown in faith. What about your ‘on-the-job training’? Is He preparing you for a special task or purpose? Of course He is. You may not know it yet and I am sure you are even asking why I must go through painful situations. But rest assured, God has the plan. He will reveal it to you someday. Be like Joseph; be ready to learn the lessons He is teaching you now. Your life is for His divine purpose, to bring glory to His Kingdom.